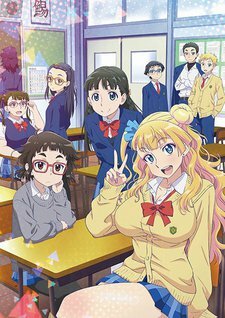 The manga follows the everyday lives of three high school girls who are close friends: Galko, Otako, and Ojou. Galko is a slightly foul-mouthed but good-natured girl who is popular in her class. Her hobby is film appreciation. Otako is a girl who sits in the corner of the classroom, but for some reason is good friends with Galko. Ojou is an airheaded girl who often talks with Galko and Otako. Each of the girls' names refers to their type. Galko is a pun on gyaru or gal, which is a term used to describe a type of street fashion where women in their teens and 20s bleach their hair and wear highly decorated nails and a lot of makeup. Otako is a pun on otaku, and Ojou refers to a girl who is a daughter of a high-class family. Episode 1 - Is It True You're a Gyaru? Episode 2 - Is It True That You're a Rich Girl? Episode 3 - Is It True That You're an Otaku Girl? Episode 4 - Is It True That You Can't Help Moaning? A series about high school, that makes fun of the strange myths that high school students believe.